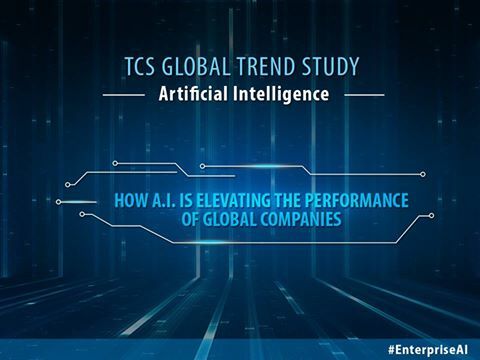 Mumbai: Tata Consultancy Services (TCS) (BSE: 532540, NSE: TCS), a leading global IT services, consulting and business solutions organisation, today unveiled its Global Trend Study titled, ‘Getting Smarter by the Day: How AI is Elevating the Performance of Global Companies’. Focused on the current and future impact of artificial intelligence (AI), the study polled 835 executives across 13 global industry sectors in four regions of the world, finding that 84 percent of companies see the use of AI as “essential” to competitiveness, with a further 50 percent seeing the technology as “transformative”. 2020, almost a third (32 percent) of companies believe AI’s greatest impact will be in sales, marketing or customer service, while one in five (20 percent) see AI’s impact being largest in non-customer facing corporate functions, including finance, strategic planning, corporate development, and HR. Companies participated from a range of industries, including automotive, banking and financial services, energy, healthcare, life sciences, industrial manufacturing, and retail. This cross-sector level of insight highlighted AI’s workplace impact as an important supplemental force for the next few years. Examples include guiding customer service representatives to more quickly resolve customer problems and anticipate future purchases, quickly and securely reconciling mass overnight transactions for financial institutions, or giving time back to HR professionals by managing the time consuming on-boarding processes for new hires. As for the ongoing debate regarding AI’s impact on jobs, business executives in the study estimated net reductions in each function by 2020 of between 4 percent and 7 percent. However, companies with the biggest revenue and cost improvements from AI see the need for at least three times as many new jobs in each function by 2020 because of AI, as compared to companies with the smallest AI-related revenue and cost improvements. AI is already being used to automate certain processes and drive efficiencies, help employees be more productive and devote more time to more strategic business needs, and create new work and services that were not possible in the past. As AI becomes a mainstream technology, financial investments in AI are set to rise, as 7 percent of companies each earmarked at least $250 million toward AI in 2016 and 2 percent already plan to invest more than $1 billion by 2020 – likely looking to gain a competitive advantage as early adopters. The Global Trend Study revealed a clear correlation between investments in AI and business impact. The companies that realised the greatest AI-related revenue improvements and cost reductions spent five times more on the technology than the companies with the lowest AI-related revenue and cost improvements. In turn, leaders generated average revenue increases of 16 percent from AI initiatives in 2015 versus 2014, whereas laggards saw a modest 5 percent revenue growth. At a regional level, North American companies were the leading investors in AI in 2015, with an average per-company spend of $80 million, followed by Europe with $73 million, Asia-Pacific with $55 million and Latin America with $51 million. Executives participating in the Global Trend Study across all regions and sectors rated the top four factors as most important to AI gaining widespread acceptance and driving business benefits. Almost seven out of 10 (68 percent) companies currently use AI to detect and prevent potential hacks and security threats to their systems. And moving forward, the other key factors include developing cognitive systems that continually learn, have the ability to make reliable and safe decisions based on masses of data, and gain the confidence of managers to trust what AI is advising them to do.